Every year April 22nd is set aside to focus on the earth … and how we can all do better at taking care of the earth. At Mansfield Plumbing, we continue to concentrate on recycling efforts. Our 24/7 operation means that we do indeed have items to recycle. From the soda cans that employees use daily to our old plaster molds, we recycle millions of pounds of materials each year. 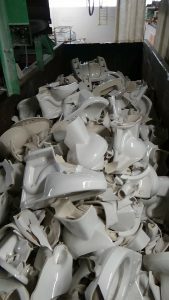 In 2016 alone we recycled millions of pounds of fired scrap and spent plaster molds, plus thousands of pounds of cardboard and cartons, paper, plastic and wooden pallets. We pay just as much attention to recycling a plastic water bottle as we do to paper in our offices to our fired scrap materials. Everything gets a new life through our recycling efforts. Our mindset makes it a routine procedure for team members to recycle. We encourage you to do your part for the environment. Whether it’s turning off lights when you’re not in a room or recycle used newspapers, every step is important.